October 16, 2017 – The NASA Orion spacecraft is being prepared for its first uncrewed integrated flight test atop the Space Launch System rocket. This image (above) shows the inside of the Neil Armstrong Operations and Checkout Building high bay at NASA’s Kennedy Space Center in Florida. A variety of test stands, processing bays and hardware are in view. 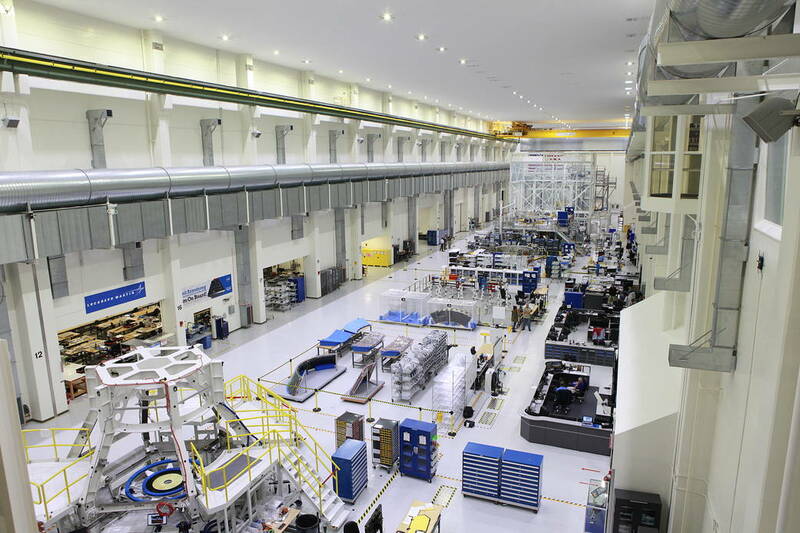 Thermal protection panels and other components for Orion are in various stages of processing. Orion will launch on the SLS rocket from Kennedy’s Launch Pad 39B on Exploration Mission-1 (EM-1). The spacecraft will travel thousands of miles beyond the Moon over the course of about a three-week period. Orion will return to Earth and splashdown in the Pacific Ocean. The mission will demonstrate the integrated system performance of the rocket, Orion spacecraft and ground support teams prior to the first flight with astronauts on board. EM-1 is the first in a broad series of exploration missions that will take humans to deep space. The mission is expected to launch in 2019.